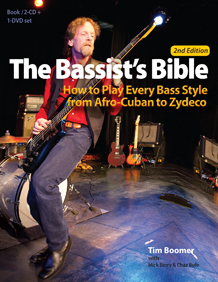 The Second Edition of Tim Boomer’s book of bass styles: “Bassist’s Bible: How to Play Every Bass Style from Afro-Cuban to Zydeco” features an introduction from Paul Jackson. Paul also helped to make sure the Funk Chapter was safe to Funk with. The new edition has a DVD along with the CDs and the written examples now feather TABs as well as standard music notation. For more information or to buy a copy check out their site at:www.bassistsbible.com.